A week from today the 2014 NAB conference will be in full swing. 100,000 video and radio people will descend on Las Vegas like locusts to see the latest and greatest in production technology. NAB Show® is the world's largest electronic media show covering filmed entertainment and the development, management and delivery of content across all mediums. From creation to consumption, across multiple platforms and countless nationalities, NAB Show is home to the solutions that transcend traditional broadcasting and embrace content delivery to new devices in new ways. 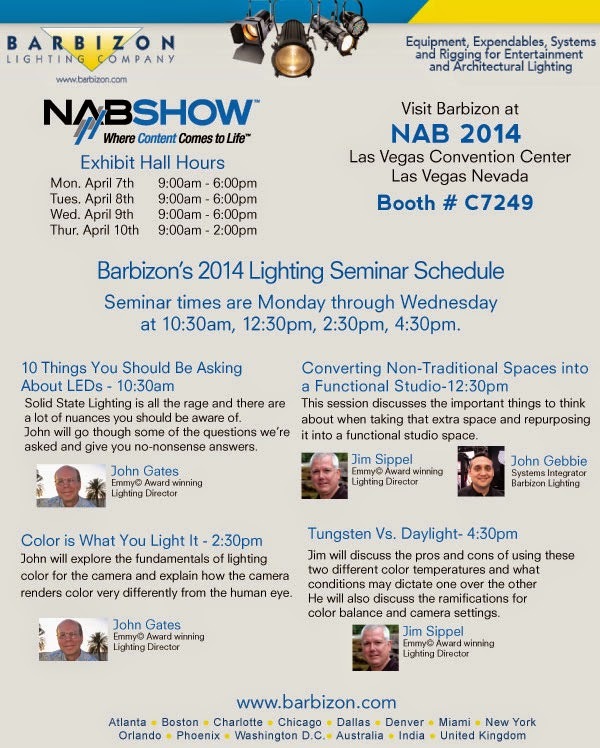 Barbizon will be exhibiting in the Central Hall booth C7249 in the Acquisition and Production area. We will be featuring the latest in lighting technology and be hosting four educational sessions Monday through Wednesday at 10:30, 12:30, 2:30 and 4:30. Solid State Lighting is all the rage and there are a lot of nuances you should be aware of John will go though some of the questions we’re asked and give you no-nonsense answers. This session discusses the important things to think about when taking that extra space and repurposing it into a functional studio space. John will explore the fundamentals of lighting color for the camera and explain how the camera renders color very differently from the human eye. Jim will discuss the pros and cons of using these two different color temperatures and what conditions may dictate one over the other He will also discuss the rami cations for color balance and camera settings.